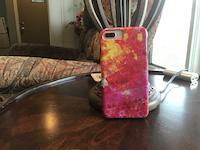 Abstract Color Relationships L iphone x case by Michelle Calkins. Protect your iPhone X with an impact-resistant, slim-profile, hard-shell case. The image is printed directly onto the case and wrapped around the edges for a beautiful presentation. Simply snap the case onto your iPhone X for instant protection and direct access to all of the phone's features! This is so alive with great colors love it .Congrats on your sale!!! Nice colors and contrasts this one really stands out!